But they do this at a lukewarm temperature, whereas the researchers wanted them to shrink specifically at 37C — body temperature — so that they’d squeeze their contents as soon as they were injected into the body. Hashmi worked with Lauren Zarzar, Ph.D., a former SEAS graduate student who’s now a postdoctoral associate at Massachusetts Institute of Technology, for more than a year, modifying PNIPAAm and testing the resulting materials. Ultimately, they developed a polymer that forms a tissue-friendly gel with two key properties: cells stick to it, and it compresses abruptly when warmed to body temperature. 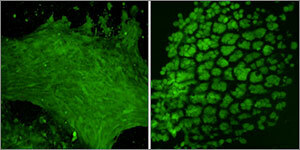 As an initial test, Hashmi implanted mesenchymal cells in the gel and warmed it in the lab. Sure enough, when the temperature reached 37C, the gel shrank within 15 minutes, causing the cells inside the gel to round up, shrink, and pack tightly together. In the embryo, mesenchymal cells can’t build teeth alone – they need to be combined with cells that form the epithelium. In the future, the scientists plan to test whether the shrinking gel can stimulate both tissues to generate an entire functional tooth. The work was funded by the National Institutes of Health and the Wyss Institute. In addition to Hashmi, Mammoto, Ingber, Aizenberg and Zarzar, the research team also included Akiko Mammoto, Ph.D., Instructor in Surgery at Boston Children’s Hospital and Harvard Medical School, and Amanda Jiang, a technician at Boston Children’s Hospital.